Get the vintage look for your pieces with our Classic Collection! 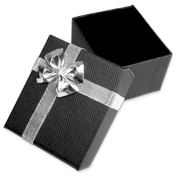 You'll find black gift boxes with a silver shiny bow, perfect for retail sales & packaging. And thanks to our special discounts you'll get the best wholesale deals!